We’re happy to announce the availability of FileCloud API. Both admin and user side APIs are available now. For The complete developer documentation please go to: //www.getfilecloud.com/developer/. 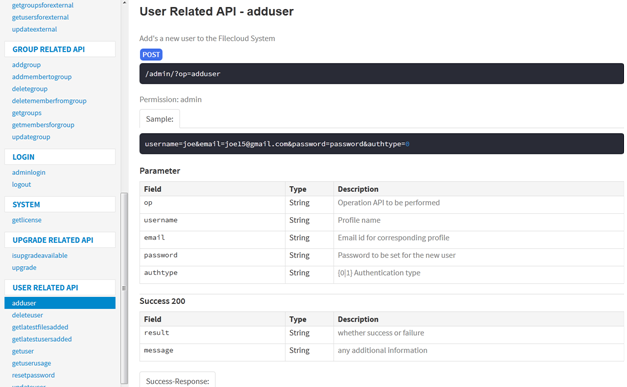 FileCloud Admin API provides the API calls to manage users, groups and activity audit information while FileCloud User API provides the API calls to manage user files (Upload, copy, delete and others) and file shares. FileCloud APIs are simple to use, RESTful HTTP APIs. We use the same APIs to build all our clients (FileCloud Mobile apps, Sync and Drive Client). With the launch of FileCloud API, Now you can easily integrate FileCloud with your Enterprise systems (Dashboards, Provisioning Systems and more)or even build your own custom apps. If you have any questions on FileCloud API, Please contact us at support@codelathe.com. Alternative to Box – Why Tonido FileCloud is better for Business File Sharing? How to edit documents in Filecloud using WPS in Android?